The history of exchange between Japan and the Netherlands started when the Rotterdam ship "de Liefde" drifted ashore in Japan in 1600. From the end of the 16th to the beginning of the 17th century, during the warring states period, Japanese culture was strongly influenced by Portugal and Spain. The Year 2009 marks the 400th Anniversary of Trade Relations between Japan and the Netherlands and commemorates the long-standing friendship between the two countries. The beginning of these commercial relations dates back to 1609, when Tokugawa Ieyasu issued an official trade permit to the Netherlands. From the onset, trade between the Netherlands and Japan did not have an economic impact alone. The impact was also felt in many creative fields from architecture as reflected in the Dutch-style houses on Dejima Island, to art, as in Van Gogh's Japanese-inspired paintings and even in the language. In 1639, the Tokugawa Shogunate prohibited the Portuguese from visiting Japan and decided to continue official trade only with the Netherlands. 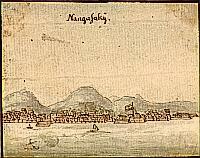 In 1641, the Dutch Factory of the VOC was relocated from Hirado to Deshina in Nagasaki and trade between Japan and the Netherlands entered a new stage. At this time, the Netherlands was the only country that provided Japan with western culture. During the Edo period western culture into Japan was almost exclusively imported through the Dutch Factory of the VOC in Nagasaki. The celebration of the 400 year cultural and economical exchange between Japan and the Netherlands has induced us to compose some web pages and offerings of a number of beautiful, rare and important items with an accent on this unique relationship between both countries. From the 17th century, Japanese noble scholars adopted western knowledge of cannons, medical science and natural science, especially natural history. In 1720, Tokugawa Yoshimune eased restrictions on imports of western books except those related to Christianity. This easing of restrictions greatly assisted studies prevailing in Japan of medical science, astronomy and the solar calendar. With the increased import of many different books, prints, paintings of lower quality and glass pictures, some painters and members of wealthy class in Japan came to accept the western artistic rationale with regard to composition and expression which stressed texture and three-dimensional effect. Japanese artists learned western techniques on their own mainly from illustrations or prints in Dutch books. Shiba Kokan (1747-1818), a western-style painter representing the Edo period created the first Japanese etchings based on illustrations in a Dutch everyday encyclopedia, the Dictiotiare Oncyclopedia edited by Noel Chomel (1633-1712). Kokan obtained from the Amsterdam copper printer Jan Luiken prints from his populair work "Spiegel van Het Menselyk Bedryf" and he produced the first real oil paintings in Japan based on this work. He named these oil paintings "Ranga" (Dutch paintings). 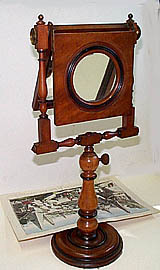 The optical mirror or Zograscope and the optical prints imported from the Netherlands stimulated Japanese painters who applied Western vision to the expression of landscapes. This Western vision also provided inspiration for the woodblock prints of landscapes by Hokusai and Hiroshige. Dutch art played a very important role in cultivating an understanding Western rationale, while Dutch maps gave the Japanese a new recognition of the world at the end of 19th century, when modern civilization began to be absorbed in earnest. 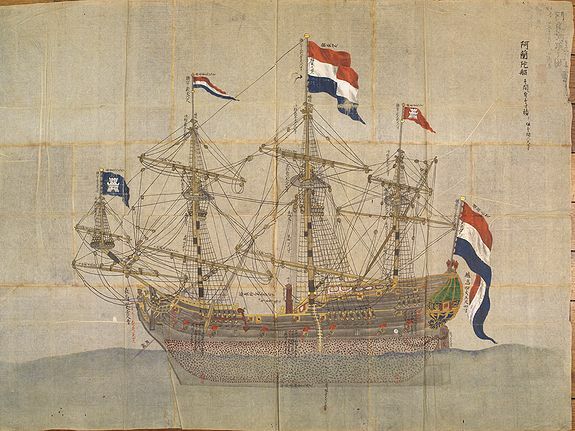 The first Dutch approach to Japan was an ambitious expedition of five ships under the command of Jacques Mahu. They left Rotterdam in June, 1598, and after crossing the Atlantic, coasting Brazil and Argentina, entered the Straits of Magellan on April 6, 1599. Because of vicious winter storms, it took nearly five months to reach the pacific side. Finally in April of 1600, a single remaining ship, 'de Liefde', commanded by Captain Jacob Jansz van Quaeckernack and piloted by the Englishman, Will Adams, made landfall near Usuki in the province of Bungo on the Island of Kyushu. Not surprisingly, these new visitors were not welcomed by the entrenched Portuguese who made every effort to turn the Japanese authorities against the Protestant interlopers. Despite these efforts, Adams eventually became a well accepted advisor to Shogun, Tokugawa Ieyasu, while some five years later van Quaeckemack was allowed to leave Japan for Southeast Asia with the Shogun's full blessing, and carrying an offer of trading privileges for the Dutch. In 1609, the Dutch East India Company arrived this time with two ships, commanded by Nicholas Puyck, which had been detached from a 13 ships fleet which had left Amsterdam in December, 1607. Puyck's ships, 'Roode Leeuw met Pijlen' and 'Griffioen', carrying a modest cargo of silk, pepper and lead. They were led directly to Hirado by two Japanese pilots, There, they received official trading privileges and encouragement to set up a factory. In 1634, the shogun commanded the construction of an island in the Bay of Nagasaki on which all the Portuguese traders could be assembled together in one place. Legend has it that when asked what shape the island was to take, the shogun spread out his fan in reply. 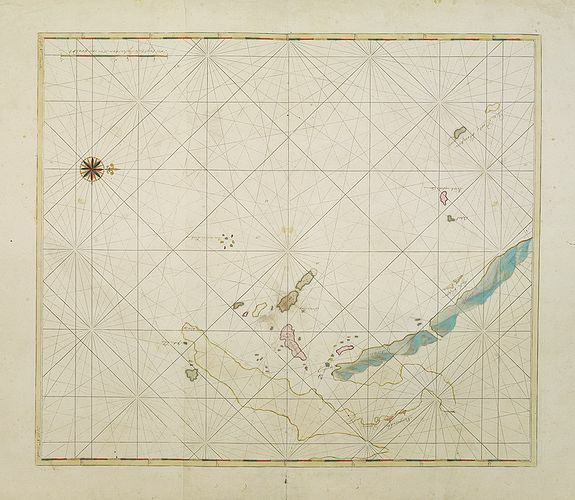 The island was called Deshima, which literally means 'projecting island'. The Portuguese were settled as soon as the work was completed in 1636. Their residence was, however, of short duration, as in 1639 they, along with all other Westerners with the exception of the Dutch, were banned from Japan for good. In 1641, the Dutch were in their turn forced to move to Deshima, and remained there together with the Chinese until Japan was opened up in 1853. According to the measurements taken by Engelbert Kaempfer, who arrived on Deshima in 1690, the maximum length amounted to 263 and the width to 82 paces, resulting in an area of 14,876 m², comparable to that of the Dam in Amsterdam. The island was connected to the mainland by a wooden drawbridge (Ichi-no-Mon). By this bridge was built a strong guardhouse, which served as the entrance to the island. The second entrance to the island was the Watergate (Ni-no-Mon), which was built at one of the short sides of the fanshape. A fence of wooden planks, covered over and topped with a double row of sharp stakes completely enclosed the island. In the initial stages, life of the Dutch on Deshima was far from pleasant. They were under constant supervision of Japanese district wardens and official spies. During the day there were gate-keepers, at night their duty was taken over by 'mawariban'. Particularly welcome of course was the arrival of Dutch ships. During the hustle of unloading and loading the ships the inhabitants of Deshima could forget their boredom, while moreover they learnt the latest news from their native country and the colonies. Despite the enormous costs involved in maintaining a foothold in Japan, the first hundred years were quite profitable to the V.O.C. By the beginning of the eighteenth century profits were steadily decreasing and the number of ships visiting Nagasaki did not exceed one or two a year. Before the turn of the century the Netherlands were occupied by the French, and the English had taken advantage of the situation by taking over the administration of the Dutch East Indies in 1811. Thus, during the first twenty years of the nineteenth century there had been a steady decline in trade contacts, which then came to a complete standstill. The 'Nederlandse Handel Maatschappij' (Netherlands Trading Company) which had taken over all the V.O.C's interests after the Napoleonic period, was not interested in Deshima. Therefore, the Dutch trading post in Japan was kept on for mainly political reasons. Soon after the opening of Japan's doors in 1859, the western bank of the island was extended for a new landing gate, and in 1867 the outer wall was extended by about seven meters to provide for a promenade from Deshima to the Kosuge Ship Repair Dock. After 1900, Deshima was swallowed up in the expansion of Nagasaki. The Landgate and the Watergate gave way to a wide thoroughfare. The channel between the mainland and the island was widened to enable the Nakashima River to flow through it. The island of Deshima is no longer recognizable as such. Today, plates show the boundary of the island after these extensions. In the same spot where once a Dutch warehouse was situated there is now a wooden building in the same style. Behind this building there is a walled garden with Deshima modeled in miniature. Nagasaki, situated in the province of Hizen on the island of Kyushu, and surrounded by hills and mountains on three sides, was one of Japan's major harbor cities during the Edo-period. Nagasaki housed a number of various schools of painting. The term 'Nagasaki school' is therefore rather a geographically defined one, applicable to almost any painter active in this area. Whatever the often slight differences between the various traditions based in Nagasaki, all schools of painting seem to have shared a large degree of realism as a common element. Nagasaki prints and paintings depict subjects connected with the port and harbor of Nagasaki and deal chiefly with Dutch and Chinese shipping and with the interesting visitors to be seen at the Dutch and Chinese factories. They also portray birds, camels, elephants and other fauna imported into Nagasaki by the Dutch and the Chinese. By its special position, as the exclusive base for import and export trade, its artists in the area could hardly avoid being influenced by the Chinese and the Dutch. The Nagasaki school shows indeed a good deal of foreign influence, some of the subjects treated evidently being taken from Dutch copperplate engravings, while others, such as the Shoho World Map, were probably copied from the Chinese originals of the last decade of the Ming dynasty. Beside on paper and silk many of the Nagasaki artists painted in oils on glass, after the Chinese manner, and they also introduced Doro-e, or mud pictures, so called because they were done with muddy water-colour pigments mixed with chalk. The Dutch commissioned work to Nagasaki painters, wanting them to paint as much as possible in the style to which they were accustomed, i.e. using Western methods of perspective, the applying of shadows and working with opaque colours. The most important painter was Kawahara Keiga, in fact the first Japanese painter to remain in the service of the Dutch on Deshima for a considerable time. A quite special category within the Japanese prints is formed by Nagasaki woodblock prints. Compared with the prints from Edo, they are rather of primitive design and applied techniques. These prints were already made in the 17th century; in most cases town plans were printed. Not earlier than in the mid-18th century, the publishing firm Hiriya publishes the first print on which a Dutchman is depicted. Except in the case of a few prints depicting Maruyama beauties and their Dutch and Chinese patrons, no Japanese subjects were treated. In general, Nagasaki prints do not bear the artist's signature, though a few late prints are signed by Tani Ho, Kogetsukwan, Isono Bunsai and his wife Seko. Nagasaki prints were eagerly sought by visiting businessmen, tourists and local residents for use as souvenirs. They sold cheaply at the time with the result that not many were preserved and very few copies exist to-day. It is estimated that there may be no more than four or five thousand copies of some three hundred-odd designs currently remaining in the world. After 1854, when foreigners also appear in other parts of the country, the Nagasaki prints lost their importance. Their function is temporarily performed by Yokohama woodcuts which, apart from depicting various foreigners, also chose all kinds of new technical inventions as their subject. 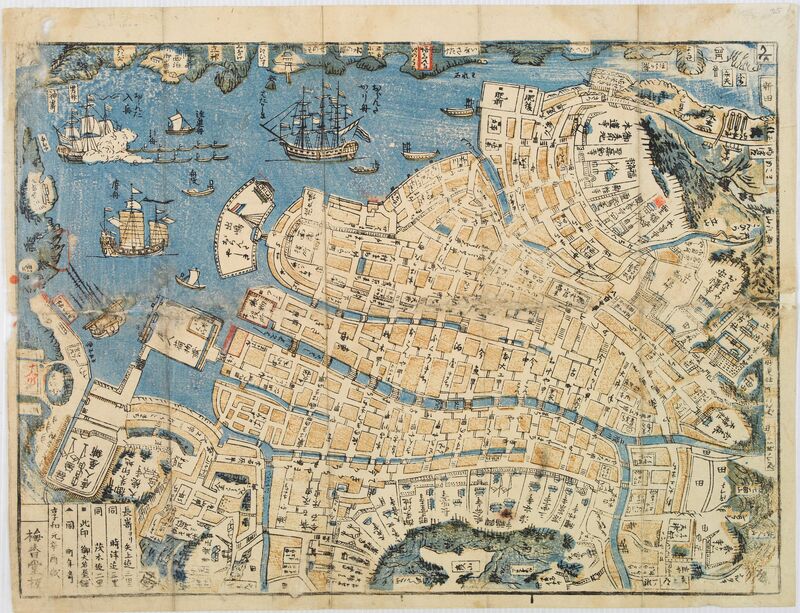 The oldest of the Nagasaki maps (Nagasaki-zu) were two panoramic prints by the artist Chikujuken that served as guides to the city of Nagasaki for visitors, who took them home as stylish souvenirs. They were such a useful guide for finding the foreign trading stations and the anchorage's of Dutch and Chinese vessels that they were continued to be published for many years. The influence of this type of panorama print can be seen in the 'Yokohama pictures' of the mid-19th century and in the bird's-eye perspectives of such pictures as 'A Comprehensive View of Yokosuka' that were still being published after the Meyi Restoration of 1868. Von Siebold was born on 17th February 1796 in Würzburg in Germany, and worked for the Netherlands government as a doctor in Java. In 1823, Siebold arrived in Japan with a special assignment. Apart from his appointment as the station doctor, he was to gather information on the trade with Japan, the country itself, its constitution, its political system and its products. His reputation allowed him to go beyond Deshima and to buy a house outside Nagasaki. An opportunity to travel in Japan arose in 1826, when he accompanied a Dutch mission to the Imperial Court at Yedo (Tokyo), typically and illegally taking surveys on the way. Siebold became fluent in Japanese and was permitted to travel and to observe the country, its manners and customs, the results of these travels and extensive researches being embodied in his magnificent work 'Nippon, Archiv zur Beschreibung von Japan und dessen Neben-und Schutzlandern,... '. It was to consist of nine volumes, of which eventually only seven appeared, but even these were not complete. It is clear that Siebold tried to deal with all aspects of Japan's nature and culture. An essential part of 'Nippon' was formed by the illustrations, which in great part were taken from objects in his ethnographic collection. We offer for sale several original prints from 'Nippon, Archiv zur Beschreibing" or "Flora Japonica" by Von Siebold. Click here for a selection. In 1835 the first installments of his 'Flora Japonica ' were finished. The 'Flora Japonica' was written in collaboration with Joseph Gerhard Zuccarini and issued in 30 parts. Only the first volume could be completed in 1841, and during Von Siebold's lifetime until 1844, only five installments of the second volume appeared. After Zuccarini's death in 1848, work on the Flora was virtually stopped, though on the basis of Zuccarini's and Siebold's manuscripts another five installments were edited by F.A. W. Miquel for publications in 1870. The year 2009 marked its 400th anniversary of a Trade relations, with cultural and economical exchange between Japan and the Netherlands and has induced us to compose some web pages and a Sale catalogue offering a number of beautiful, rare and important items with an accent on this unique relationship between both countries.